A young girl, Georgia, is fascinated with shapes, colors, and objects. Her family does not share nor comprehend her love for art, so they deem her different. With her strong will and determination, Georgia moves to New York to discover a life as an artist. The illustrations help the reader detail the beauty of her work as they take us through the life of Georgia O&#39;Keffe. 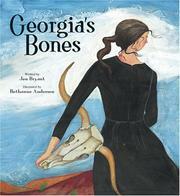 Bryant, Jen, “Georgia&#39;s bones,” Children's Picture Book Database at Miami University, accessed April 20, 2019, https://dlp.lib.miamioh.edu/picturebook/items/show/13250.